The Tour de Force (now Le Loop) was run in 2006 and 2010 exclusively for friends and family of the William Wates Memorial Trust. Due to its overwhelming success and interest from everyone we told about it, we have decided to open the 2012 event to anyone who loves cycling, is ready for a challenge and would like to support WWMT. Here is a short article about the 2010 event. What is it about the Le Tour that makes it so special? I have pondered this on many occasions and, of course, it is not one single factor but a combination of many. To ride in Le Tour is a huge commitment. It is not just the physical endeavour required on the chosen stages but also the months of training beforehand. All of the riders are amateur and are fearful of the challenge that lies before them, be that a single stage, a few stages or the whole 3600 km Tour route. This creates an atmosphere around the event. Nervous laughter abounds at our pre-tour get togethers and training rides. We shake our heads at our own stupidity for taking on the challenge. And yet on we go, training through the rain and snow, sacrificing family time and pushing ourselves in the knowledge that what is to come is truly terrifying. So the preparation and anticipation forms a vital part of what makes the Le Tour special. Will the hard work be rewarded? Like all big events the devil is in the detail. The event organisers ran it like clockwork. The correspondence before the event was timely, informative and friendly. It created a sense of security for riders to know that accommodation was booked, meals were arranged, bike transport facilitated and all of our needs thought through and taken care of. The foundations were in place and we just needed to get ourselves to France and ride what we had set out to do. On the Tour itself the staff were exceptional. No stone was left unturned to make our journey as stress free as possible. Phil, Sarah and the team understood that the physical requirements of the Tour left very little energy for anything else so they organised us with military efficiency. Our bags were laid out for us on arrival at each destination, every new rider was greeted personally and shown the ropes, bikes were sorted, food stops were a highlight and problems were solved which most of us never even heard about. It was an awesome performance on their part carried out with flair and humour and a huge contributor to the happy vibe around the tour. So to the Grand Depart in Rotterdam where the stage was set for the next 21 days. There was a sense that something extraordinary was about to happen but we didn’t know how that was going to manifest itself. We knew about the physical demands but what about the social demands of touring with strangers, new arrivals coming in every day and good friends departing.? What about the differing abilities across our groups? Would the routines work? Somehow it did all work. Every rider showed a selflessness and generosity of spirit that belied the exhaustion they felt. The camaraderie we had never diminished and friends were made for life. There was laughter and tears, pain and triumph and it was a heady mix. Many had personal issues from home but through a combination of individual will power and collective strength the vast majority achieved what they set out to do. Without this team spirit it would have been an awful lot harder to realise our dreams and that was special. 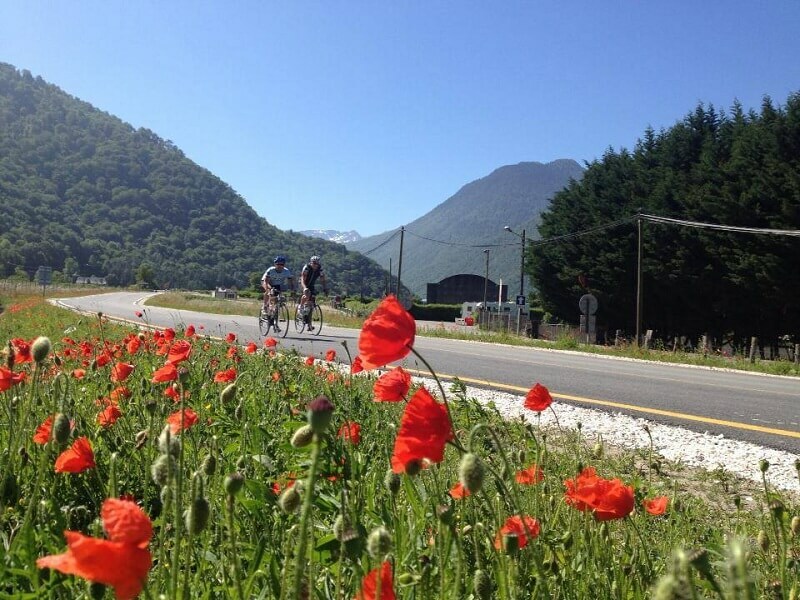 France is a beautiful country to cycle through. There were moments of extraordinary peace on lonely mountain roads, wonder at the richness of the agricultural areas, fascination as we wound our way through the iconic Bordeaux vineyards, elation as we reached the top of Tourmalet in the stunning evening light and joy as we rode into Paris. There were so many highlights and France never disappointed. The people were charming, hospitable, encouraging and curious and the country left its mark us on all. France, and its people, made Le Tour special. Much has been said of our physical endeavours but many would agree that our fundraising efforts were equally awesome. To have raised £450,000 says an enormous amount about the qualities of the riders on the event and their supporters. This figure tells you that they went the extra mile and were not satisfied with raising the minimum but wanted to go on and really make a difference. The money raised will go to charities that help young people who have their own incredibly difficult challenges to overcome and with the experience the Trust has built up, since 1998, there is a confidence that the money will be well spent. £450,000 is a special amount to raise and the sense of achievement of all concerned should be profound. So we cycled huge distances over fearsome terrain. We were supported by an amazing team, we achieved our goals, we made friendships for life and with a fair wind we would love to do it all again!! For our family though this was also about remembering Will and celebrating his life. So on behalf of us all I would like to thank you from the bottom of our hearts for helping to keep his memory alive in such an inspirational fashion.